Gary Cohn, Trump’s top economic adviser and a former Goldman Sachs executive, is departing his position at the White House. For Cohn, the final straw came after Trump’s decision to impose new tariffs on aluminium and steel. Gary Cohn, the director of the National Economic Council and President Donald Trump’s top economic adviser, is leaving his post at the White House. Recently, Cohn was unable to persuade the president to forgo tariffs on steel and aluminium. Cohn attempted to convince Trump that such tariffs would be damaging to the US economy, but Trump went ahead with the new trade barriers over the objections. Cohn attempted to set up a last-ditch effort to get Trump to soften the tariffs by arranging a meeting with business executives who would be hurt by the new tariffs, which function as a tax on imports. But according to Axios’ Jonathan Swan, Trump canceled the meeting. According to a report from Bloomberg’s Jennifer Jacobs, Trump asked Cohn in a meeting on Tuesday to publicly back the new tariffs. The president asked if Cohn was on the “same team” on the trade measure, but the adviser did not respond. Cohn was brought in from Goldman Sachs to help shape Trump’s economic agenda on trade, taxes, and more. The early parts of his tenure were marked by rumours that the former commodities trader could be promoted to chief of staff or take over for soon-to-depart Federal Reserve Chair Janet Yellen. According to The New York Times, which first reported the departure, Cohn held renewed talks with Trump about the chief of staff role after the recent controversy surrounding John Kelly’s role in the Rob Porter domestic-abuse scandal. But Cohn’s relationship with Trump hit a rough patch when it was reported that he had been dismayed at the president’s response to the violence in Charlottesville, Virginia, in August. He criticised the president’s statements about the violence in an interview with the Financial Times. 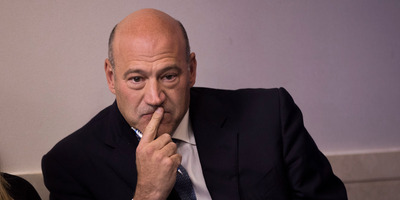 The interview led to Cohn falling out of Trump’s favour and bumped him from the top of the list to replace Janet Yellen as chair of the Federal Reserve. Cohn’s Jewish faith also made him a target of white supremacists during his time in the administration. 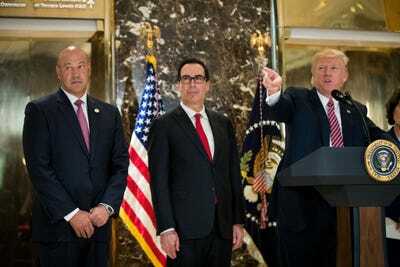 He was reportedly “disgusted” with statements that Trump made at a press conference last summer, during which he said there were “two sides to a story” of what happened in Charlottesville. Trump also placed some of the blame on the counterprotesters while refusing to categorically condemn white-nationalist protesters, one of whom authorities say killed a woman when he drove a car into a crowd of counterprotesters. Drew Angerer/Getty ImagesFrom left: Gary Cohn, Treasury Secretary Steven Mnuchin, and President Donald Trump. Trump’s comments at that press conference cost him the support of CEOs, leading to the dissolution of two business-advisory councils. Cohn was at the press conference, which was meant to promote an infrastructure plan, but it quickly went off the rails as reporters questioned Trump’s response to the violence at the “Unite the Right” rally. There were rumours during the fight over the bill that Cohn was already eyeing an exit as soon as the tax bill passed Congress. Cohn departs as a favourite among investors. Analysts say Wall Street believes Cohn is one of the driving forces of the deregulation effort in the White House and serves as a counterweight to the protectionist trade wing of Trump’s inner circle. Following the news of Cohn’s departure, US stock futures tumbled with Dow Jones industrial average futures down over 300 points, or 1.3%, and S&P 500 futures down a little over 1% as well.